I realized a long time ago that I'm a Catholic Geek. I may not always act it but my faith is at the center of my life. My car has all types of Catholic paraphernalia. I have a library of Catholic books (most unread) and I could probably wear a different Catholic t-shirt for nearly two weeks. Another aspect of my geekiness hit me Monday when realized that Iwas aware of two PENDING announcements of appointments of bishops in the United States that were to be released on Tuesday. Geekiness doesn't have to mean boring just like these two bishops don't appear to be boring. When people think of bishops they imagine old men with pointy hats. People sometime imagine bishops, as wells as priests, brothers and sisters as these old curmudgeon type of people who spend all of their time in prayer with all sorts of joy sucked out of them. This couldn't be further from the truth. Sure, there is a fair share of curmedgeony priests and nuns but the vast majority of religious people live life to the fullest and are full of joy. The priests that I know personally are great people who enjoy laughing, movies, television shows, reading and the day to day activities that the rest of us do. They enjoy cracking jokes and drinking beers at Yankee games. The announcement of the pending appointments of these two bishops yesterday (Bishop Paprocki of Springfield, IL and Bishop Wenski of Miami, FL) are two examples of bishops who are people just like you and me. At the announcement in Springfield, Bishop Paprocki let everyone know that he enjoys running and has run 16 marathons since 1995. He also enjoys playing hockey. He is a goalie and he has been called the "Holy Goalie." Not to be outdone, Bishop Wenski in Miami is an avid motorcycle rider and can be seen wearing his leathers out on the road. 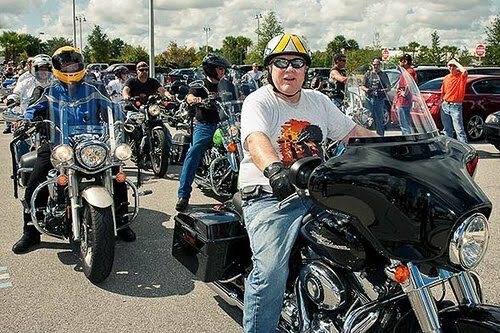 In Orlando he even held a benefit ride called Bike with the Bishop to benefit Catholic Charities. I think these two men are excelent examples that you can be pious and have fun. It is personally a relief to me to know that, while I still need to grow and mature spiritually, that I can still be the jeans and t-shirt wearing big old honking goober of a Catholic geek than I am now.